It can be pretty disappointing to find drinks like Gatorade or Powerade at gyms these days. We’re encouraged to drink things like this after a 30-45 minute workout and it’s completely unnecessary. Do you know what some of these drinks contain or what they can do to you? They can also contain brominated vegetable oil. Oh and it’s banned in Europe and Japan (FYI). The truth is, if you’re working out occasionally for 30-45 minutes, you’re better off with water (perhaps water with lemon) or an alternative like coconut water. 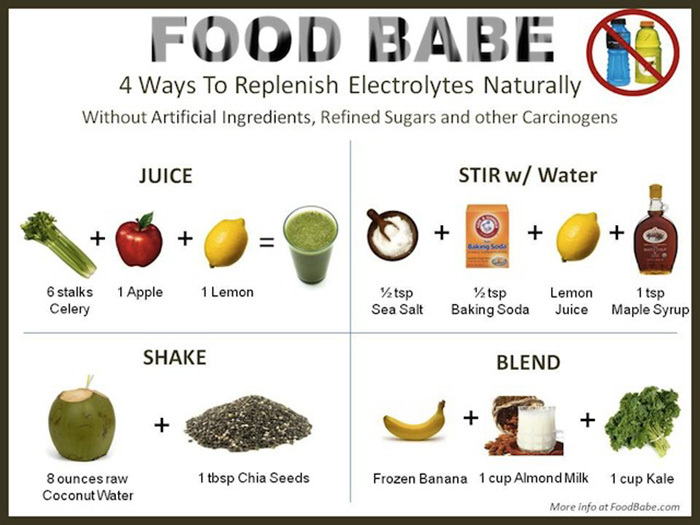 So if you need to replace electrolytes (which is what drinks like Gatorade or Powerade claim to do), why not check out these other methods (graphic via Food Babe). 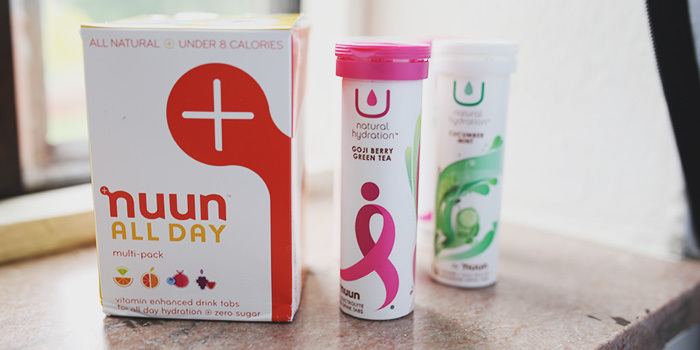 Another great option are two of Nuun’s products: Nuun All Day and U Natural Hydration. The two products both help keep you hydrated and are slightly carbonated. Nuun offered to let us try these products for free and we can’t wait to utilize them on days where we need to hydrate fast or are on the go. If you give them a try, let us know what you think! It is amazing all the sugary drinks so called “workout professionals” suggest. Just have some water! The worst is seeing those chocolate milk ads with a gigantic glass in the hand of professional athletes (obviously getting paid a lot). I mean, that’s a joke right? Do people actually believe that downing a glass of sugar and dairy is a good idea after working out? lol. It is pretty crazy. And I really don’t think people think about it (and when it comes to sugar, they don’t look to see how much is in their drinks). Drinking sugar is probably the worst thing you can do after a workout! Yikes.